January 1st 1897 I was busy about the work most of the afternoon Bob went to the valley to cut wood. Will was working about the place all day. It was warm & pleasant. Saturday 2nd 1897 It rained a little this morning but cleared a little so we started to town. Went on over home for it began to rain quite hard came home in heavy rain. Found Bob had taken] good care of everything. I read all evening. Sunday January 3rd 1897 It rained nearly all day it was late when we got up I was busy with house work all forenoon. I read in afternoon and in the evening wrote some letters. 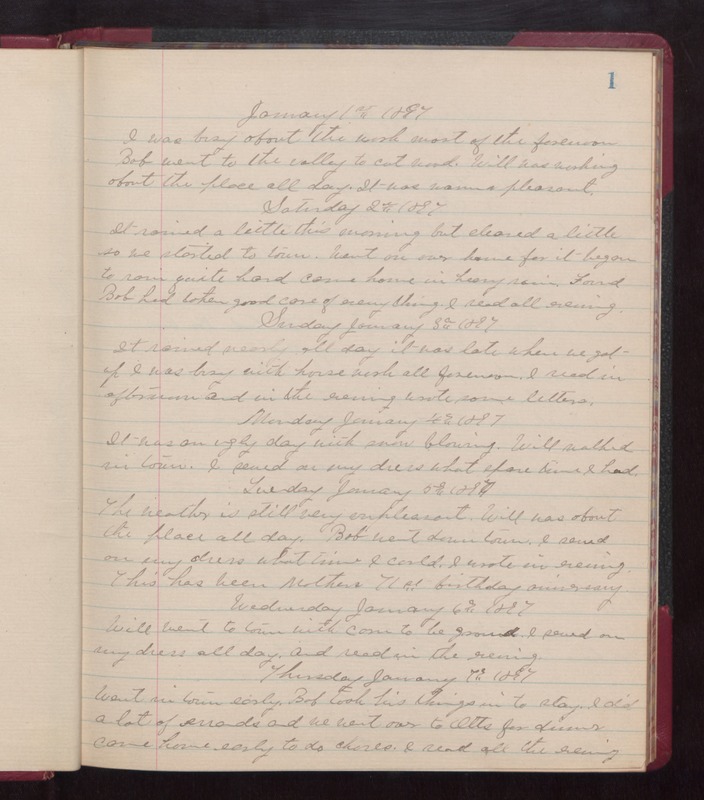 Monday January 4th 1897 It was an ugly day with snow blowing. Will walked in town. I sewed on my dress what spare time I had. Tuesday January 5th 1897 The weather is still very unpleasant. Will was about the place all day. Bob went down town. I sewed on my dress what time I could. I wrote in evening. This has been Mothers 71st birthday anniversary. Wednesday January 6th 1897 Will went to town with come to be ground. I sewed on my dress all day, and read in the evening. Thursday January 7th 1897 Went in town early. Bob took his things in to stay. I did a lot of errands and we went over to Otts for dinner came home early to do chores. I read all the evening.